The opening scene from the Disney Pixar movie Up is, in my opinion, the epitome of cinematic perfection, an entire story and lifetime told without a word being spoken. Theatre Re’s The Nature of Forgetting is the theatrical equivalent of that kind of perfect storytelling. There are a couple of words spoken “Grandma’s coming, she’s bringing a cake”, it’s Tom’s birthday and his daughter has had to pick out his clothes and hang them at the end of the rail, he can’t even remember her name without prompting. As he moves along the rails of clothes they spark memories of long ago, a lifetime passed. 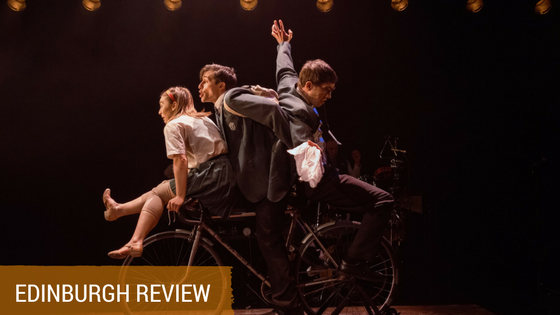 What follows is an absolutely magical mixture of dance, mime and live music which takes us back to Tom’s schooldays and his first love, his childhood friends and relationship with his mother. As he experiences each memory he must fight not to lose it forever to the disease which has taken hold. It flows at an incredible pace and is bursting with energy. The cast don’t stand still once and everything is part of the performance including costume changes, Guillaume Pigé gives his heart and soul to the role of Tom. The music, which is played live, is so hauntingly beautiful. It soars and gathers pace in time to the story being told, from the frenetic ‘Banquet Trance’ to the softness and gentleness of ‘Isabella’s Theme’ it perfectly matches the action on stage. It took sixteen months to develop The Nature of Forgetting in collaboration with UCL Neuroscience Professor Kate Jeffrey and every minute was worth it, because this is a highly innovative and absorbing performance piece which grips audiences from start to finish. By the time Grandma arrives with the cake, and you see the number of candles burning, your heart is shredded in to pieces, The Nature of Forgetting is one of those incredibly beautiful pieces of theatre you are likely to remember for a long, long time.